Work on Spectrum of the Seas is continuing at Meyer Werft. The latest milestone is the attachment of the podded propulsion system, which is built by ABB in Helsinki. It's not a matter of just screwing on the pods. It takes at least a day and a half to install the 200-ton unit. In this video, Royal Caribbean manages to shrink it all down to about a minute. Propellers will be attached to the pods in February. Spectrum of the Seas will enter service in China in June. It may take a few viewings to read everything and see everything in this video. This is something you don't see often anymore. Earlier this month Ritz-Carlton's first ship was launched at the Hijos De J. Barreras Shipyard in Vigo, Spain. Unlike most cruise ships today, which are much larger (the unnamed Ritz-Carlton ship is only 24,000 tons to give customers a much more intimate experience), this ship was built on land and then slid down rails into the water. There's still more work to do to complete this ship. It's scheduled to enter service in February 2020. Please note this video came from B-roll so there is no sound. 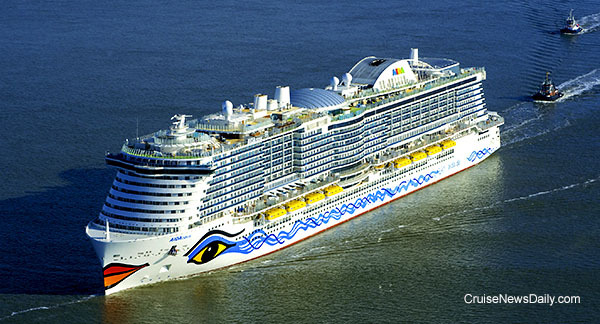 Meyer Werft advised Carnival/AIDA today that AIDAnova will not be delivered as early as expected. In a statement, the company didn't point to anything in particular that had gone wrong, instead indicating that the testing and certification of the new technology is just taking longer than expected. Meyer said the longer testing period has delayed the start of the first longer sea trials, and therefore, they are delaying delivery. Details appeared in the October 25 issue of Cruise News Daily. The last cruise ship just left Alaska, but like the Cubs, Holland America is already looking forward to next year. 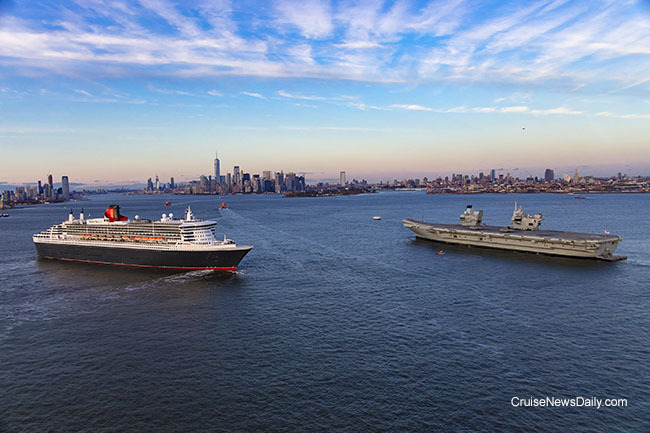 Two British icons had a royal meeting in New York Harbor today when Cunard's Queen Mary 2 crossed paths with the Royal Navy's new HMS Queen Elizabeth aircraft carrier. Details appeared in the October 26 issue of Cruise News Daily. It's time for a change. Chef Curtis Stone is freshening up the menus in both of his Share restaurants aboard Princess Cruises American-based ships as well as adding to the Crafted by Curtis selections on the menu in the main dining rooms. Early this morning, MSC Divina arrived in New York, a port call on its repositioning from Europe to Miami where she will spend the winter season. AIDAnova has been patiently waiting at Eemshaven at the mouth of the Ems river waiting for fuel, and last Thursday it finally came. The German taker Cardissa arrived with a full load of about 3,500 cubic meters of Liquified Natural Gas (LNG) for the new ship so it could go on sea trials. Silversea will debut six new shows aboard their ships in the next few months. Each of the six shows will be unique to one of the ships. The three existing shows will remain common to all the ships. The complete story appeared in the October 23 issue of Cruise News Daily. The Port of Miami posted record traffic, both in passengers and cargo, for the fiscal year, which ended September 30, 2018. While they posted records in cargo both in amounts of movements and in volume, cruise passengers were up 4.7% with 5,592,000 passengers. The increases resulted from new ships, new lines, and longer seasons for seasonal lines. Holland America Line will have ABB retrofit three of their ships with connectors that allow them to connect to shore power while in port. This will enable the ships to completely shutdown their engines while in port and draw their power from a shoreside power plant, thus reducing the ship's air emissions. Many cruise watchers forgot about the hurricane potential on the West Coast, and the eastern Pacific has been active this year. Willa is currently a category 4 hurricane and predicted to make landfall south of Mazatlan late Tuesday afternoon. So far two lines have said they are moving two ships from their Mexican Riviera itineraries this week. The complete story appeared in the October 22 issue of Cruise News Daily. Details appeared in the October 22 edition of Cruise News Daily.